In a medium saucepan bring 4 cups water to a boil reduce the heat so the water simmers and add the garlic. Cook for 5 minutes. Add the vinegar and salt, raise the heat, and bring to a boil, stirring until the salt dissolves. Remove from the heat. In clean 1-quart jars with screw top lids. Divide the seeds and peppercorns between the jars. 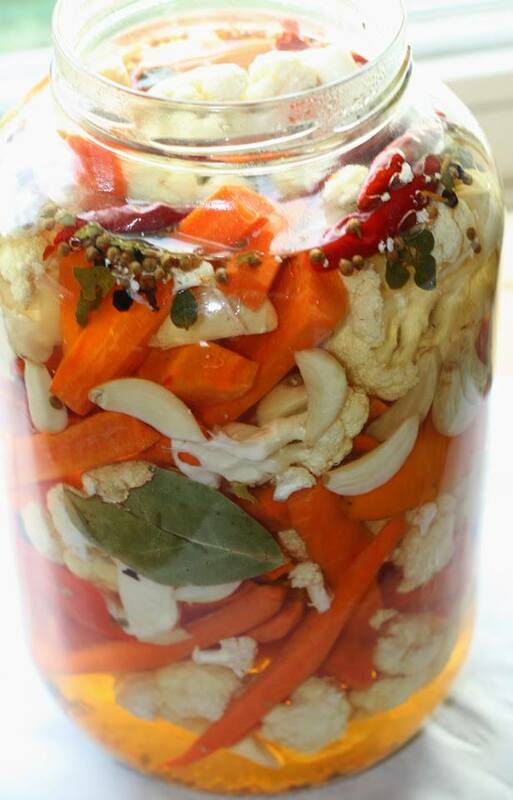 Place 5 cloves in each jar and then pack the jars full of carrots, cauliflower and chilies. Bring the brine back to a boil, pour it over the vegetables to cover completely, let cool, then cover and refrigerate. The pickles will taste good in just a few hours, better after a couple of days. And they’ll keep for about 2 months under refrigeration.